Science of Solvent Weld | Lubrizol Advanced Materials, Inc.
Solvent welding is a form of welding that uses chemistry and geometry rather than heat to produce a permanent molecular bond. When the right mixture of solvents and radial pressure are applied the pipe and fitting become permanently bonded, functioning as a single component. 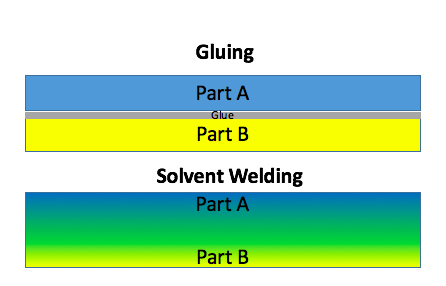 Glues work by providing a sticky layer between two components to create a bond. If the two parts were actually in direct contact they wouldn’t stick because there would be no glue between them. Solvent welding requires the two components to come into contact as the solvent cements allow the parts to molecularly bond with each other. 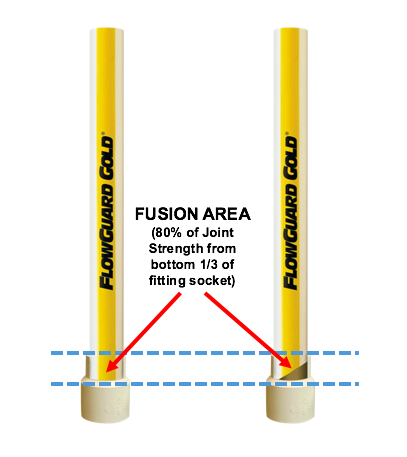 Interference Fit: the inside of a FlowGuard Gold® fitting is specially tapered to create a “fusion area”. In a properly assembled system, 80% of the joint strength comes from this fusion area. Because of this it is important to be sure that installers avoid angled pipe cuts, clear away burrs and filings, and check the fit of the pipe and fitting prior to solvent welding. FlowGuard Gold Plumbing Systems are supported by a team of piping systems consultants. To learn more about solvent welding and proper installation practices, contact us today.